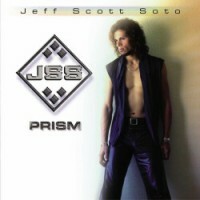 Well... here’s another re-release by JSS (Jeff Scott Soto) and while ‘Lost in the Translation’<?xml:namespace prefix = o ns = "urn:schemas-microsoft-com:office:office" /> is a solid piece of rock music, ‘Prism’ is huge disappointment in my humble opinion. Most of the songs here are nothing more than boring pop/rock ballads that haven’t left a mark in my brain; however a few songs could be labelled as rock music, but sadly they remind me very much of Lenny Kravitz... and I can’t exactly say I’m a huge fan of him. I think I gave this album 10 spins in the row... but nothing sticks. I prefer my music a bit harder but I must admit that I enjoy a well written AOR CD now and then, but ‘Prism’ is not real rock in my ears. It’s music for housewives. Fans of Jeff Scott Soto knows what they get and other AOR fans could check it out and decide if this is something to spend their hard earned money on.